Well, it is time for another pagan subscription box review! 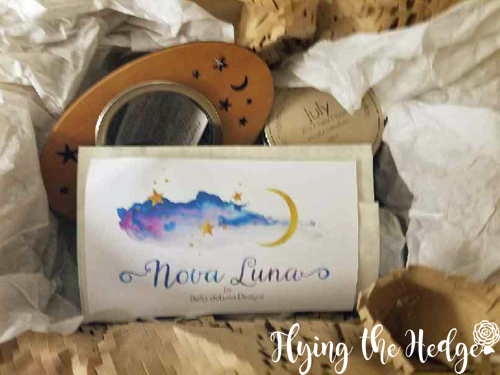 After Gaia Collective's Moon Box, I decided to try Nova Luna by Bella deLuna Designs, a box dedicated to celebrating the New Moon each month. 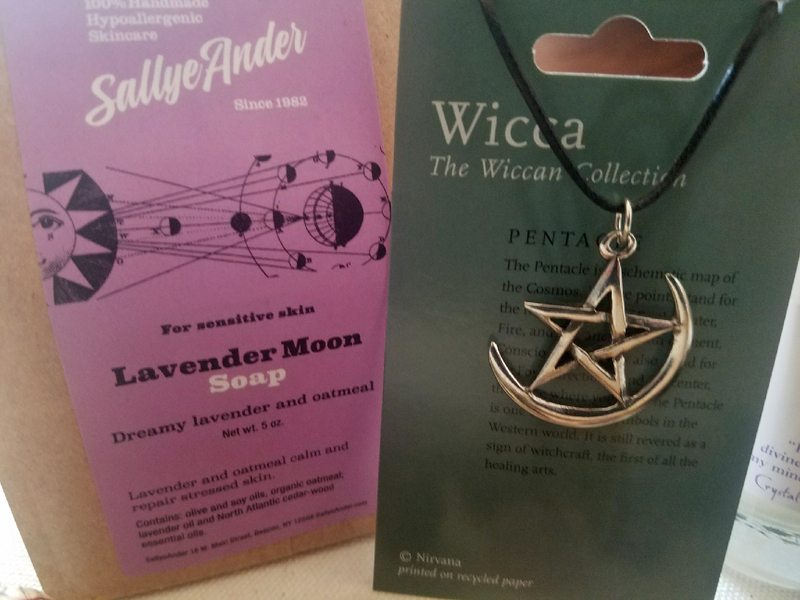 I am excited to be able to celebrate the M oon cycle all month long with the help of these boxes. When I arrived home from my unexpected trip to Michigan, this little baby was waiting for me. I'm not going to lie, after some of the things that have happened this month, it was nice to have something come just for me. 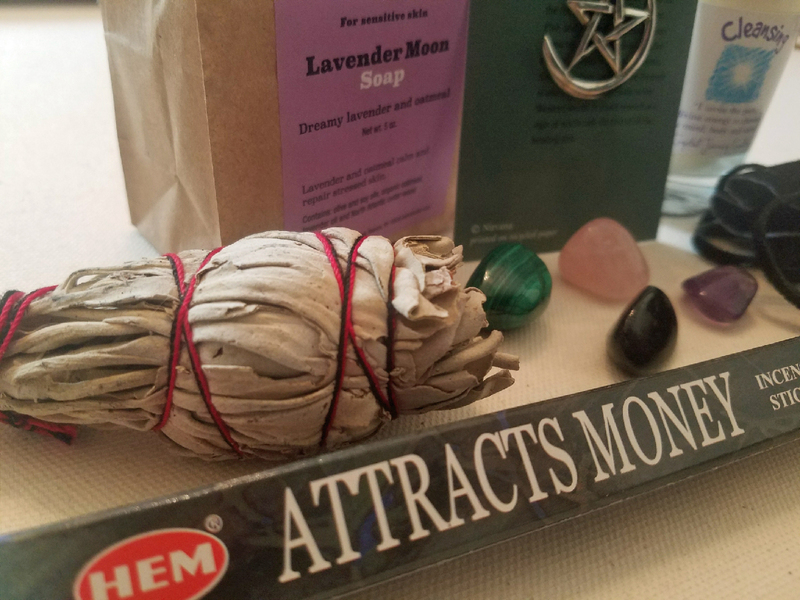 I love these little gifts each month. 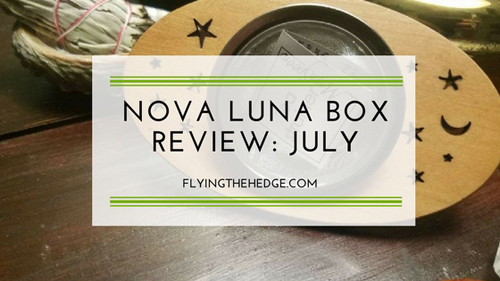 Upon opening the box I was greeted by a Nova Luna card and a letter explaining the contents of the box. The card contained a list of the items included in the box and the value of each item. That's something new. Reading the prices let me know that I was getting more than I paid for which is a really great feeling. I didn't have to go searching for the prices myself as I have had to do for past boxes. The letter explained the New Moon in Leo, what to expect during this phase, a break down again of the price of each item, and a little bit about how to use each item during your New Moon ritual. The letter was informative and let the reader know where they could find more information. Unfortunately, there was no mention of where all the items came from, except for the tea. I'd like to know which businesses I am supporting. 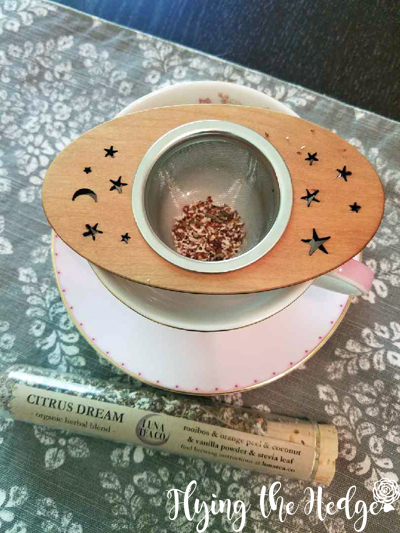 The next item I noticed was the celestial wooden tea nest from Moon Spoon. What a lovely surprise! I ADORE tea and this tea strainer is one I can use over and over and over again and easily clean. The strainer pops right out of the wooden base for easy cleaning. Furthermore, it contained directions on how to use it, so if you are unfamiliar with loose leaf tea, you'll have no problem using the strainer. The directions also listed the company, hence why I know it came from Moon Spoon. 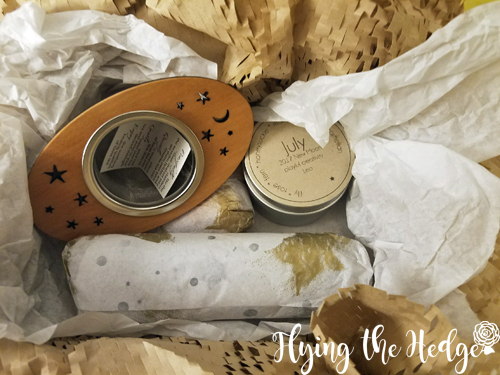 Next to the strainer were two packages wrapped in starry tissue paper and bubble wrap. The longer of the 2 contained a tea from Luna Tea Co. 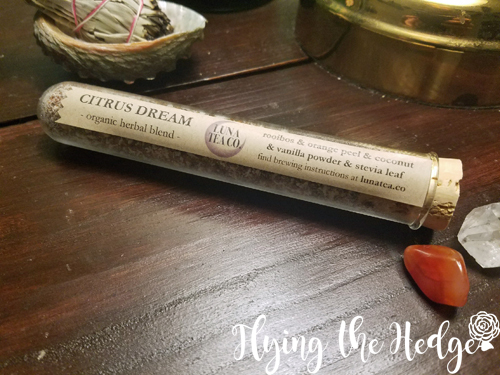 The tea is called Citrus Dream and contains rooibos, orange peel, coconut, vanilla, and stevia leaf. According to the label the tea is an organic blend. 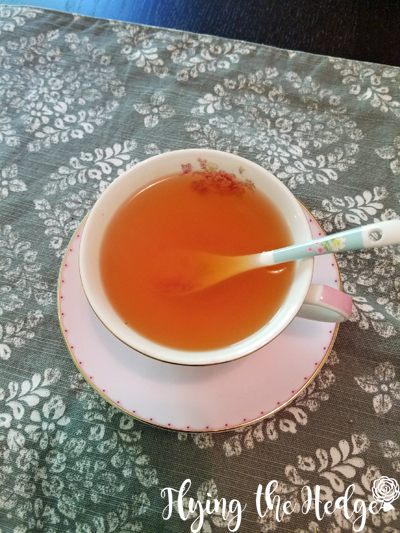 Once brewed, the tea takes on a wonderful orange hue, perfect for the New Moon in Leo. The vanilla is strong and the subtle sweet of the stevia and coconut make for a delightful blend. Furthermore, I love that the tea came in a glass vial with a cork stopper. Once the tea is gone, this will make a great witchy bottle to store other herbs, feathers, and the like. 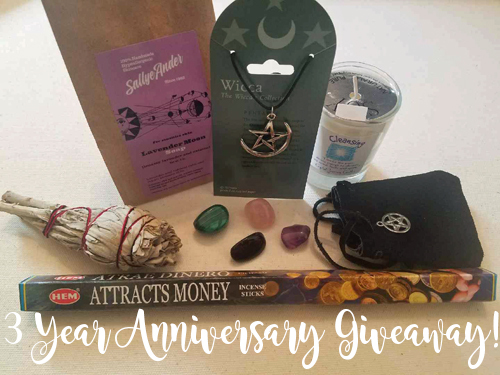 In the next package was an orange sachet containing a gemstone cage necklace and a cracked quartz crystal that was dyed purple. 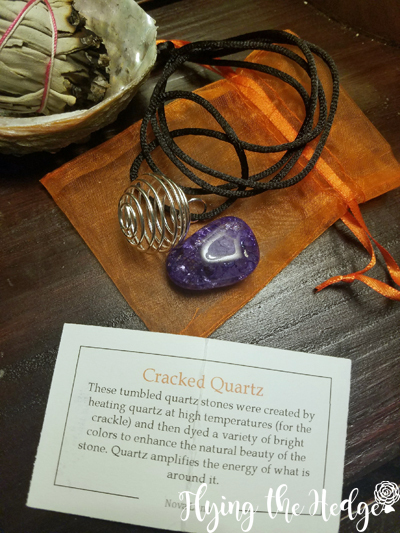 According to the information card that accompanied it, the tumbled quartz stones were heated at high temperatures to cause the cracking then dyed a bright color. It gives a very brief description of quartz amplifying the energy around it, but nothing more on the magical properties of the crystal. Honestly, I hate that it was dyed. While it looks neat, I would have preferred natural quartz. The necklace, however, it pretty great. 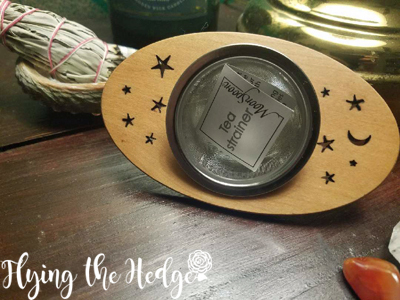 The metal cage stretches well and will fit most medium to large crystals, making wearing any stone you have charged easily wearable. On top of it, you can change the crystal out easily without breaking it. The only downside is the string attached to it. It is silky and the knot will not hold up long term. I would put this on a metal chain, and plan to purchase one just for the cage. 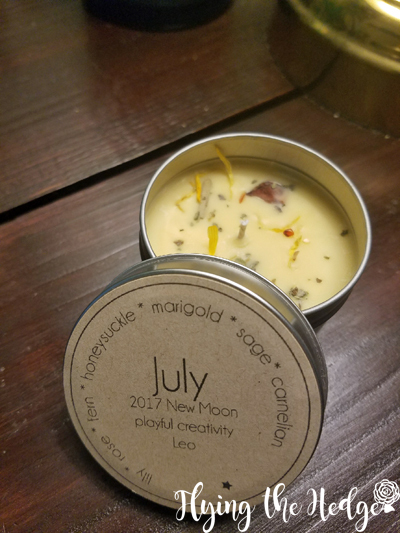 The last item I pulled out was the July 2017 New Moon candle. 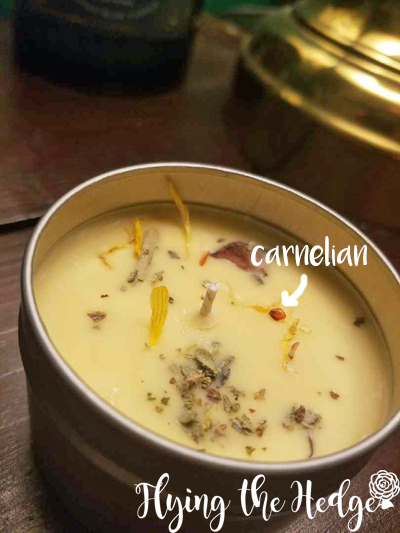 It contains lily, rose, fern, honeysuckle, marigold, sage, and carnelian. Not going to lie, it smells so amazing. The rose is strong, with subtle hints of marigold, lily, and honeysuckle. There are little chips of carnelian in the candle that can be saved for later use after the candle has been used up. This New Moon in Leo is about moving forward, getting rid of things that are not a resounding yes, regaining confidence, and being creative. I look forward to releasing the negativity in my life and starting a new. Overall I enjoyed this box and felt I got my money's worth. I look forward to seeing what the next two boxes have in store for me. 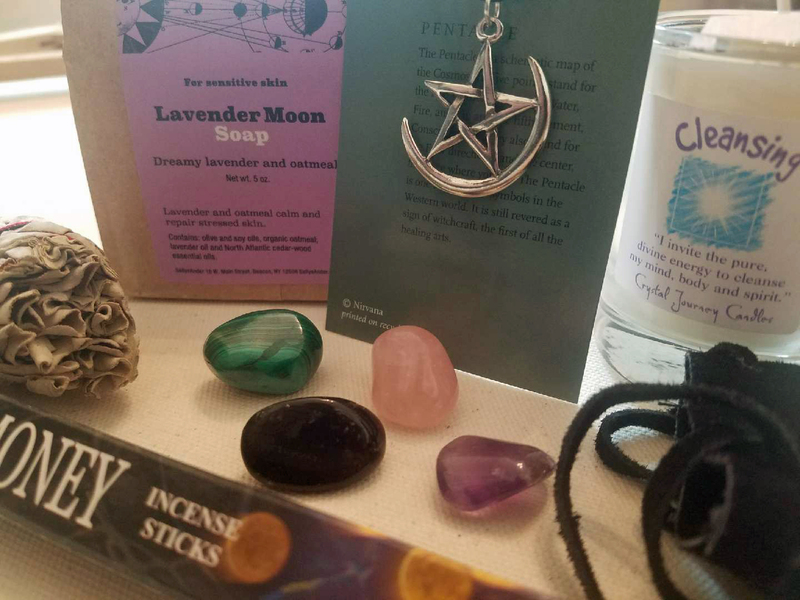 I'm sure at this point most of you are aware today is Amazon Prime Day, but did you know there are lots of pagan items on the list of Prime deals?! Now, this isn't a complete list, but it's a pretty good start. Unfortunately some of the deals are done, so I didn't bother posting them. 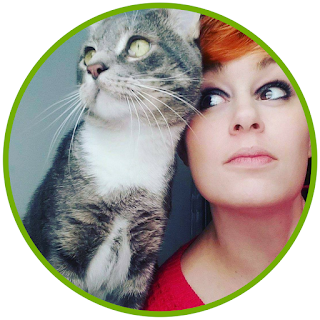 The essential oil diffusers sold out before I realized Prime Day had begun! So sad, but hopefully they will have more available later. 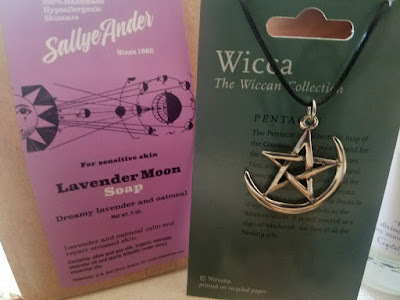 As of right now, here is a list of upcoming and current Prime deals for witches and pagans. Please note some these items are upcoming Prime deals while others are no longer avialable. I will update as I see more deals become available.